Please contact owner Mono at 808-345-four three six three. 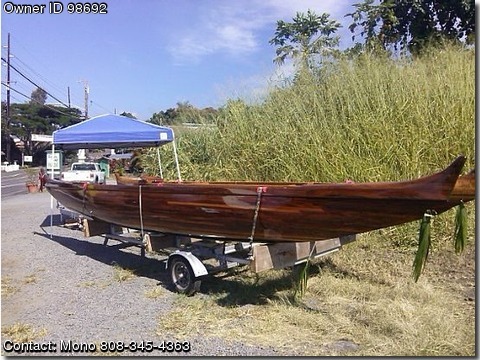 Boat is located in Big Island, Hawaii. Brand new trailer never used includes Koa outrigger 1 Koa steering paddle & 3 regular paddles, carbon fiber mast and spars, block and tackle rigging for mylar sail, outrigger has 5 airtight compartments. Hull is Hawaiian Koa with Nytex fiberglass liner. This boat is 95% complete.